On 14. June 2001 was given to Town Český Krumlov a new flag by the chairman of Parliament of Czech Republic Václav Klaus by his decision No. 62. The old green-white flag used till then was not heraldicly correct, and so it had to be replaced. New shape came from colors at valid historic town symbol, which last look is given by emblem privilege of Jan Kristián of Eggenberg, published on 15. April 1671. The flag got its final shape after a small modification in order to distinguish it from flag of town Hodonín. There are 3 vertical stripes on new flag, in proportion 1 : 4 : 1. In the middle of white stripe is red rose with yellow seed and green petals. Proportion of width and length of flag is 2 : 3. The size of central rose is not given exactly, but committee for heraldry and vexilology recommends to use a rose of size of one half or two thirds of flag width. For first time could one see the flag during Celebrations of Five petalled Rose and since then it is installed at Krumlov City hall during all important events. On Tuesday 14. August 2001 officially handled over the chairman of Parliament Václav Klaus a decree about using of flag of Town Český Krumlov to hands of vice mayor Miloš Michálek. This act was held in Parliament in hall "State acts". Since then can everyone display new Krumlov flag. There is no restriction for doing so." "According to the legend, the family of Witigonen has its origins in Ancient Rome. The family was related to the Roman Ursini family, who is said to have resided on the mountain „Mons Rosarum„ near the city of Rome. After Rome was plundered by the hordes of the Visigoth leader Totila in 546, the family left Rome and one of its members named Vítek (in German, Witigon) travelled together with his wife and child up to the north, passed the Donau river and settled in Southern Bohemia. He started a new family there and gradually acquired extensive domains, which he gave to his five sons before his death. Each son received a coat-of-arms with a five-petalled rose, the color of which symbolized each particular dominion. So much for legend - historical reality offers us some slight variations. Vítek did not come to South Bohemia in the 6th but the 12th century, and he did not come from the Italian family of Ursini but from the family line of a Czech Princess of the Přemyslovci. In 1173 Vítek of Prčice was mentioned as an envoy to the Emperor Friedrich Barbarossa, and in 1179 he apparently settled in Southern Bohemia. The fact that his domains were not liable to the so-called law of escheat indicates his strong influence, as his property did not have to return to the hands of the family of Přemysl. Vítek could freely dispose of his properties and therefore gave it to his four sons - Jindřich of Hradec; Vítek II senior, predecessor of the Lords of Krumlov; Vítek III junior, founder of the family of Rosenberg; and Vítek IV. 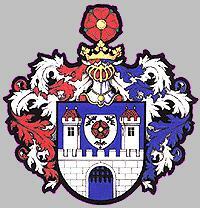 It is likely that the then newly founded residences Nové Hrady (New Castles), Rožmberk (Rosenberg), Třeboň and Krumlov fell into the rank of domains of the Vítek family, while Krumlov would have been their fourth castle in the rank. This historically important moment is rendered in the painting "Division of the Roses", which can be viewed in the sightseeing tour at the Český Krumlov castle." "Old Flags" of Český Krumlov are in fact the armorial banners of different branches of Vítkovci (in German Wittigonen - perhaps this is the reason for German name Wittingau of Třeboň town): Argent a Rose Gules, buttoned Or and barbed Vert - Lords of Rosenberg / z Rožmberka. - Rožmberk town in District Český Krumlov still Bear it as its Arms. Gules a Rose Argent... - Lords of Landstein/z Landštejna - Landštejn Castle is a great ruin in District Jindřichův Hradec on historical borders between Moravia, Bohemia and Austria. Azure a Rose Or - Lords of Hradec - Hradec is today Jindřiichův Hradec. Or a Rose Azure (variant: Or a Rose Sable) - Lords of Ústí. - Sezimovo Ústí has not very interesting history - the most interesting history is the long interruption of its history - between 1420 and 1830s existed no Sezimovo Ústí at all. In the picture not presented Branch Lords of Krumlov bore Argent a Rose Vert - that's why the old flag of Český Krumlov was white over green.